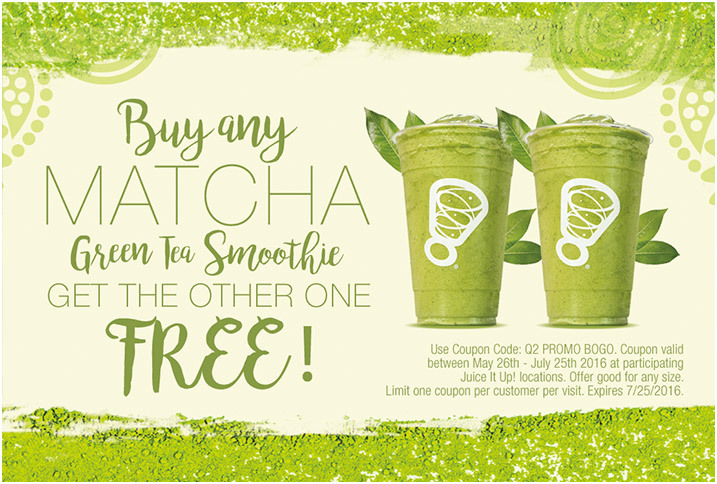 BOGO FREE MATCHA GREEN TEA SMOOTHIE DEAL RUNS THROUGH JULY 25 @ JUICE IT UP! - EAT WITH HOP! Home / DEALS / DRINK / BOGO FREE MATCHA GREEN TEA SMOOTHIE DEAL RUNS THROUGH JULY 25 @ JUICE IT UP! Either print the coupon above or show it on your mobile device to get the deal! Between May 26 to July 25, 2016, buy one Matcha Green Tea Smoothie and get another free !! Limit one coupon per customer per visit. I've never tried their Green Tea Smoothie here before. Actually I've only been to Juice it Up! once in my life and it wasn't a great experience...but probably because I don't know how to order and got something I didn't like. I got the Watermelon smoothie and didn't like probably because watermelon concentrate tastes a bit funky. But, the drink that I did end up loving was this pressed juice that had all the veggies in it. I don't remember what it's called but that one I wish I ordered a bigger size of! I'm a bit of a Matcha snob so I hope this drink is legit! And this deal is great because you have such a long time to redeem it! Heck! If I had one near me I would probably get it multiple times a week because this deal lasts two months!